Home » Posts » Attentionology for K-5 Teachers » Let Students Warm Up to Wake Up! Do you have students that seem like they’re still asleep when they get to school? Here’s an idea to help kids wake up…lead them in some warm-ups at the start of the school day. Add in some quick hoop time with your morning math time. Pick up on kids’ interest in sports to wake them up with sport-related warm-ups. In the US and in other communities worldwide kids (and adults) love to shoot hoops and follow pro basketball. 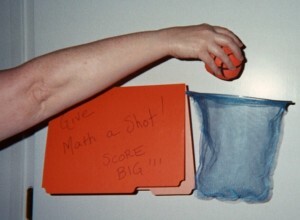 Invite kids to “give math a shot.” Call on sluggish students; challenge them to walk up to your improvised net and make a shot at the correct answer to a math problem you pose. Hand them a miniature soft basketball (no concern for classroom damage with toy balls) and act like they’re super sports stars with math problems. Add some language arts connections to your sports-related warm-ups to wake students up by holding a contest. Get kids to submit suggested names for your class “team.” Write the entries on slips of paper; drop them in a bag or box (preferably one with a sporty design) and hold a random drawing for a winner. Team names generate excitement. Sports fans are passionate about their teams. In the current NBA playoffs, teams include the New York Knicks; the Boston Celtics, Miami Heat; the San Antonio Spurs the Oklahoma City Thunder and others in the eastern and western (US) regions. …Use warm-ups to introduce a sports-themed writing time by announcing that the class needs to “warm-up for writing.” Kids love this! and then making shots at an imaginary basket you’ve pointed to at the front of the room. Then ask them to listen for the vocabulary of the game in with a free-verse poem I’ve written about basketball that you can share. The poem best suits students in grades 3 – 5. I wrote the poem in a style that helps students understand the impact that sound words have on effective writing and the importance of including action words that suit the subject. Offering rewards wakes up students any time. Back to math, set up a small net and invite students who offer correct answers to problems you pose get to shoot the toy basketball. If they make the shot they get to pose the next math problem. It’s a little like the US game of round robin, but the focus is on reinforcing math skills, building kids’ confidence and ability to think and act quickly. Inexpensive sets of small nets with soft basketballs are available in dollar stores and toy stores, and not just during basketball season. I recommend setting up your basketball net on an as-needed basis, not as a permanent fixture in your classroom. Otherwise the game may lose its magical power to catch and keep kids’ attention. Encouraging students to be “HOT SHOT KIDS” has applications in all subject areas. For example, you can group kids into teams and ask everyone to bring small coins to school. When a member of a team makes a basket, another team member drops a coin into a collection basket. Parents might like to team up with your Shoot Some Hoops Service Project. 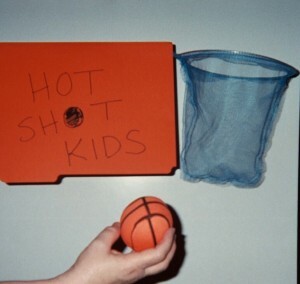 You’ll need to set up a simple system for collecting donations based on how well your students shoot hoops. You’ll serve as the team “manager,” tracking students’ scores to insure honesty in the fundraising. You’ll of course also need to set up the distance your students are required to stand from the net to shoot based on their grade level and ability. Offering curriculum-related sports-related fun works in any season, rain or shine. These attention-getting tricks are proven incentives and great ways to warm up K-5 kids to wake them up for learning! Check the score here on Wednesday with a new Mid-Week Focus.